This is a 5.6K (3.5 mi.) round trip to Lake Michigan requiring approximately 3-4 hours to complete. The path is adorned with grasses, shrubs and wildflowers of the dunes. 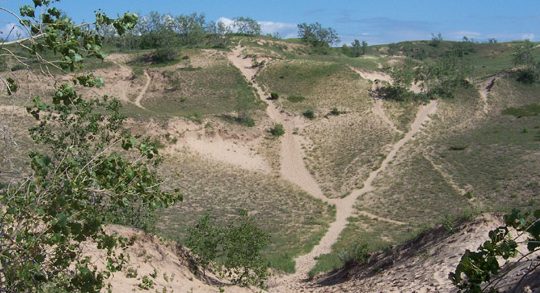 The terrain is steep and is strenuous with rugged dunes and loose sand. Drinking water, sturdy shoes, suntan lotion, a hat and sunglasses are recommended. 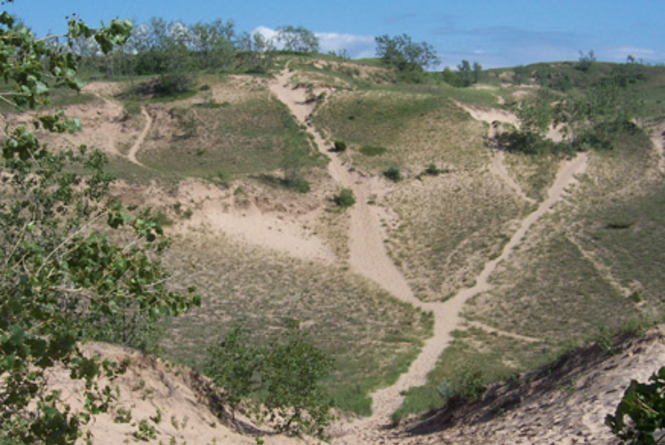 Trailhead: The Dune Climb off M 109 (8.1K [5 mi.] north of Empire). The National Lakeshore charges a visitor fee of $20 per vehicle for a seven day pass or $40 for an annual pass. Mountain bikes are not allowed on any of the National Park trails. Pets must be kept on a 6-foot maximum leash.